9/11/2011. Trampers. Booth Road, Davies (formerly Warburton), Swampy Saddle, Nicols Creek. Nine of us met at Booth Road. We entered Davies Track via McGoun this time, exiting it on the left a short way up past the cairn. A light shower came on during the bush section, sounding quite pleasant as it struck the leaves overhead. 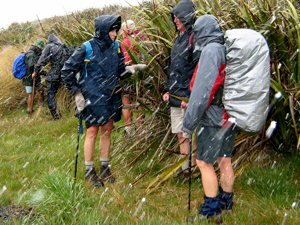 Out in the tussock at the top, the weather was clear again. Ria and Hazel had discovered a new track had been made above the bush, this time striking to the left instead of the one to the left, the one that got several of us lost last time where overgrowth had rendered a crucial turn invisible. We emerged on the Flagstaff walkway above a rock outcrop and headed down to the top of the Pineapple. 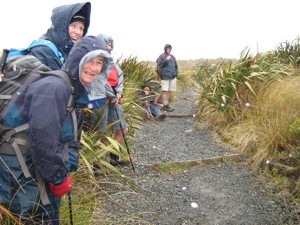 Here Gay, a visitor, left us and we continued along Swampy Ridge to the top of the Nicols/Moonlight track. A little way in and we found the track has been ruined by mountain bike wheels cutting a narrow deep groove down the track middle, making keeping our footing on the restricted track-sides difficult and dangerous. Further down, we kept to the Moonlight side of Nicols Creek and traced, where we could, the original track, bisected however by the zigzags of the mountain bike route. Rain now really set in and we sheltered in nearby bush for lunch. 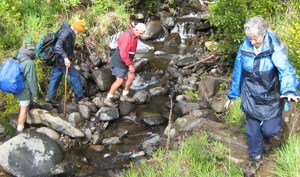 We then continued down the old track, through the macrocarpas, the stone outcrop and yet further carefully down to emerge at the creek crossing below the waterfall – to Ian’s delight but Ria’s chagrin who had hoped to emerge onto the Leith Valley road on the north side instead of now forced across to the other side. So it was down and out and up Islay St back to the cars. All felt it had been another good day out. Too dull and showery for photo opportunities however. – Ian. 14/11/2007. Trampers. Woodhaugh, Ross Creek, Davies, Pineapple, Ross Creek return. Moderate. Leaders: Ria, Hazel. In Leith Valley, where Otago’s first industry – sawmilling – is reputed to have started about the 1860s, is the start of the old Pineapple Track. Originally, it was named Ross Track, after Archibald Hilson Ross, who owned most of the land in the vicinity. In the early 1920s, Mr Oscar Balk, first president of the Otago Tramping Club, led parties of trampers up this route. At the top of a rather steep section, the parties would stop to rest and often refresh themselves with a tin of pineapple. This tin was sometimes left hanging on a tree or fence, and the track came to be called the Pineapple Track. The line of the Pineapple Walkway has deviated from the original track in places to provide more scenic variation. The original vegetation of the area has been modified as a result of early milling, burning and stock grazing, but remnants of the milled species (podocarps) still remain. Rimu, miro, totara and matai are found in isolated pockets, mainly in damp gullies. Even so, the overall distribution of plant species retains some semblance of natural order with the larger forest trees growing at lower altitudes. Podocarp broad-leaved forest type occurs with shrub species which grade out into Dracophyllum shrub land and ultimately tussock grassland communities on the summit area. Some common plants: fuchsia, pepper tree, lemonwood, broadleaf, totara, five’finger, wineberry, lancewood, Muehlenbeckia, Dracophyllum, Coprosma, Hebe, and wild spaniard tussock. There are many varieties of birds in the bush areas where there is an ample food supply to sustain many nectar-, berry-, and insect-eating native birds. Some of these are: New Zealand pigeon, bellbird, fantail, tomtit, brown creeper, tui, silvereye, rifleman and pipit. 17/10/2001. Trampers. 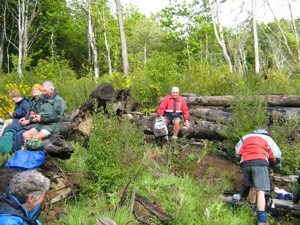 Nicols Creek – Swampy Saddle – Warburton Track. Leaders: Lex, Mary L, Irene.